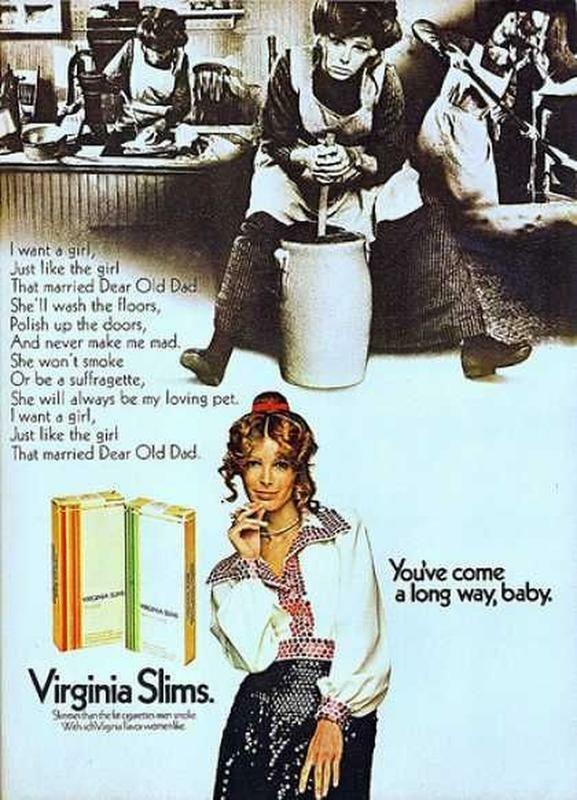 Perhaps no other marketing campaign in the history of advertising captured the spirit of the times like the Virginia Slims’ “You’ve Come a Long Way, Baby!” campaign. The series of print and TV ads were a bit of a history lesson…showing what women endured in the past juxtaposed with a modern, liberated woman. In the midst of the women’s liberation movement, these ads served as a measurement to show women that, even though they were still fighting for total gender equality, they had come a long way over the years. March is Women’s History month, so it is only fitting that we take a look at how one company’s marketing program helped support a social movement. 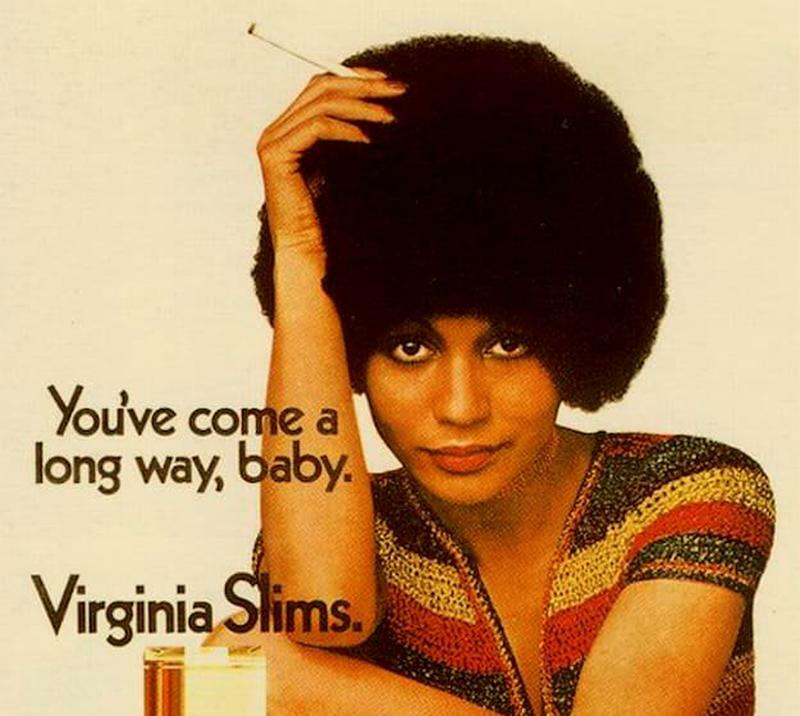 The Philip Morris Company introduced Virginia Slims on July 22, 1968. This was the first cigarette that was designed and marketed for women smokers. 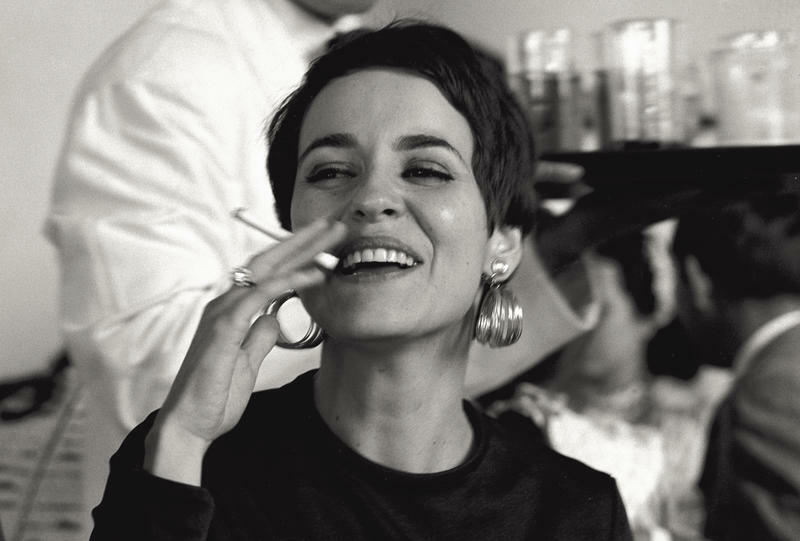 The majority of adults in the 1960s and 1970s smoked and women were no exception. 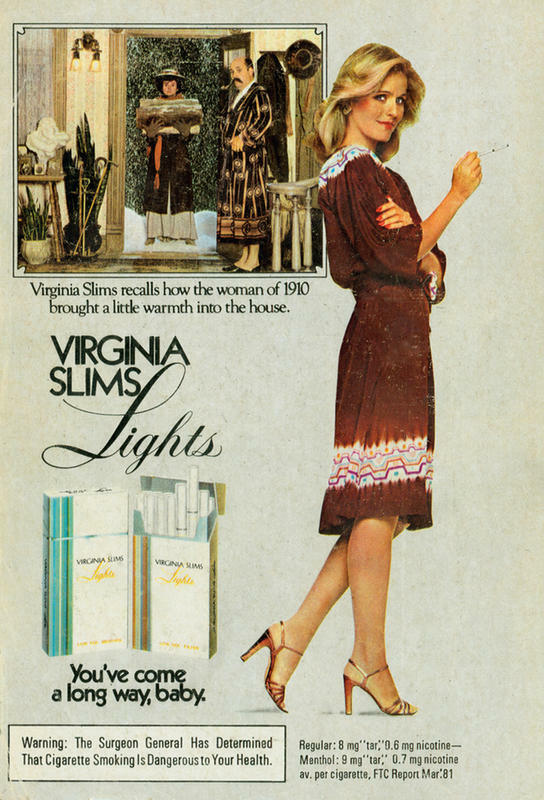 Virginia Slims were thinner so they would look more graceful in a woman’s hand. The cigarettes were packaged in a gold-trimmed box. Now they just needed a catchy marketing campaign that appealed to women. 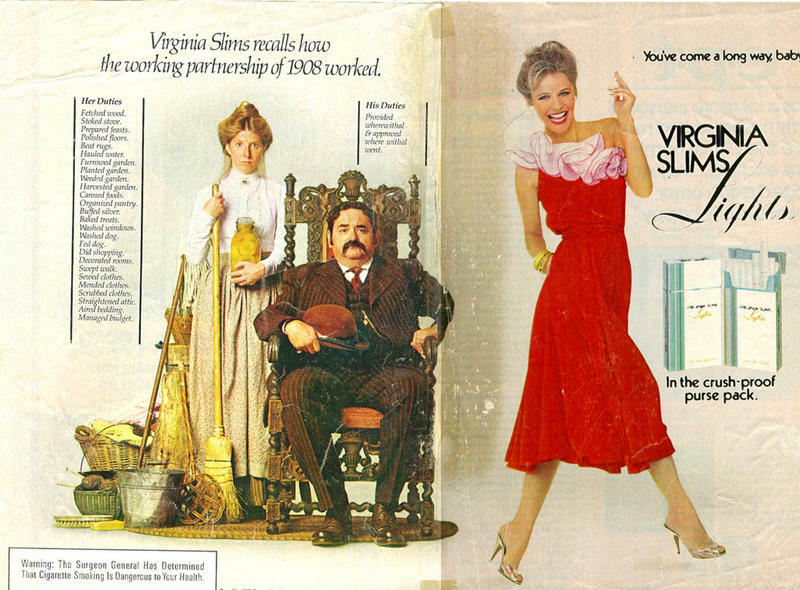 Philip Morris hired the award-winning Leo Burnett Agency to develop a marketing plan for Virginia Slims. It was new to target a whole product to women and the 1960s mad men wanted to be sure to hit on several things with their ads. First, they wanted to reach their target audience. Second, they wanted to equate smoking Virginia Slims with independence, confidence, and success. Lastly, they wanted the message to be uplifting and motivational in a non-patronizing way. The Virginia Slims cigarettes were designed to be fashionable, but the marketing team opted not to spin the cigarette as a fashion accessory. They felt that focusing on the visual appeal of the product sent the wrong message. They wanted to show substance over beauty to appeal to intelligent, sophisticated women. 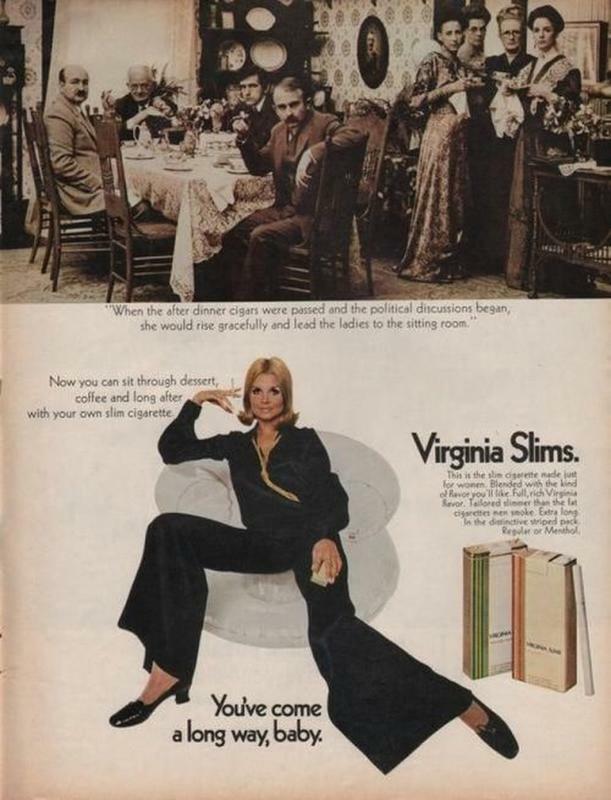 Understanding the importance and potential of the women’s liberation movement, the marketing team behind Virginia Slims, which was initially comprised of only men, sought to develop a feminine voice and message for the cigarettes. They landed on the idea of contrasting the oppression and lack of women’s rights from history with the freedoms and independence of contemporary women. The motto, “You’ve Come a Long Way, Baby” was chosen to represent the brand and its message. 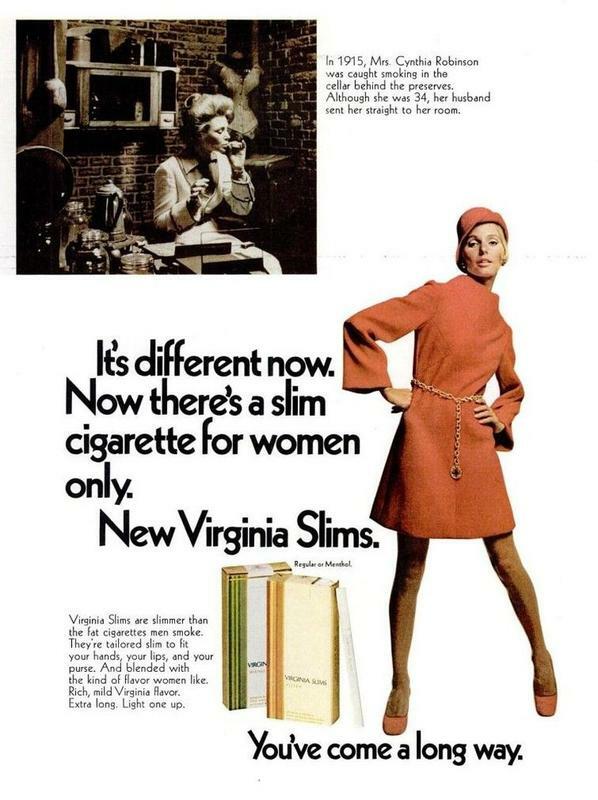 As the Virginia Slims ads became more popular, the marketing team moved beyond the depiction of women being punished for smoking to show the lifestyle difference between women of the past and women of the sixties. In one ad, for example, an old-fashioned woman is hanging laundry on a clothesline. The caption read, “Her husband told her she could get out of the house once a week.” Another showed a woman standing in mud, feeding pigs. It read, “Virginia Slims remembers when women first went to work in the stock market.” The message of these ads was that women in the past were overworked and underappreciated, but modern women had more freedoms, choices, and control over their own lives. 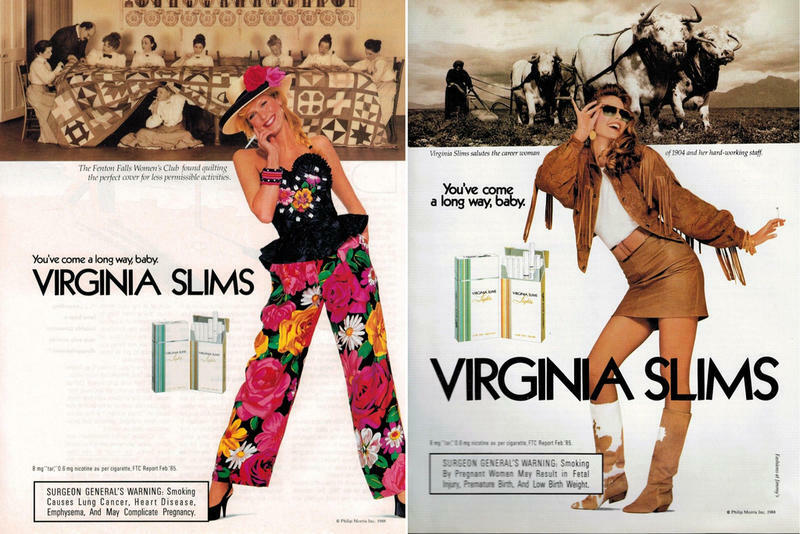 Critics of the Virginia Slims “You’ve Come a Long Way, Baby” advertising campaign complained that the women depicted in the ads were not breaking gender barriers; they were breaking laws. They claimed the ads applauded the actions of rebels and criminals. While it is true that there were laws in many areas making it illegal for women to smoke, the Virginia Slims campaign was intended to show the rights that women have already gained in their fight for equality. 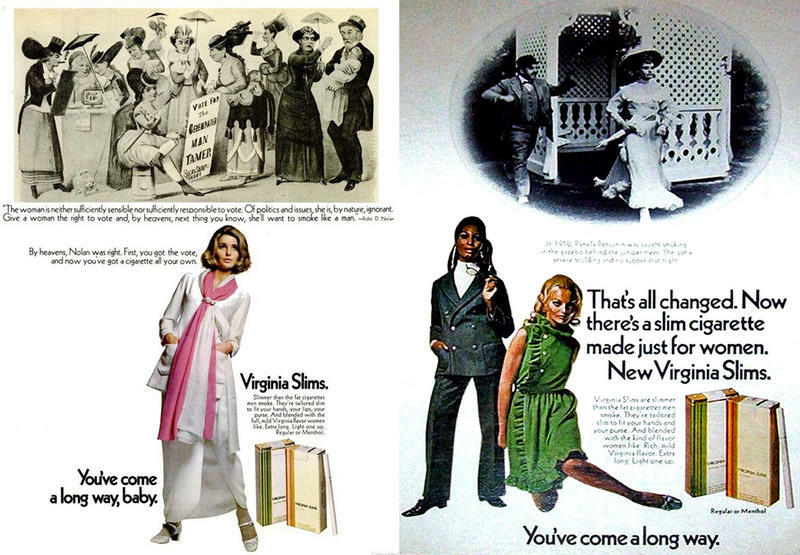 Although the goal of the Virginia Slims ad campaign was to promote gender equality, many feminists felt that the brand was delivering a mixed signal by using “Baby” in its slogan, “You’ve Come a Long Way, Baby.” To them, the slogan was addressing women and calling them by the condescending and sexist label of “Baby.” The ads were, on one hand, trying to empower women to be independent and strong, but on the other hand, still calling them by a patronizing nickname. 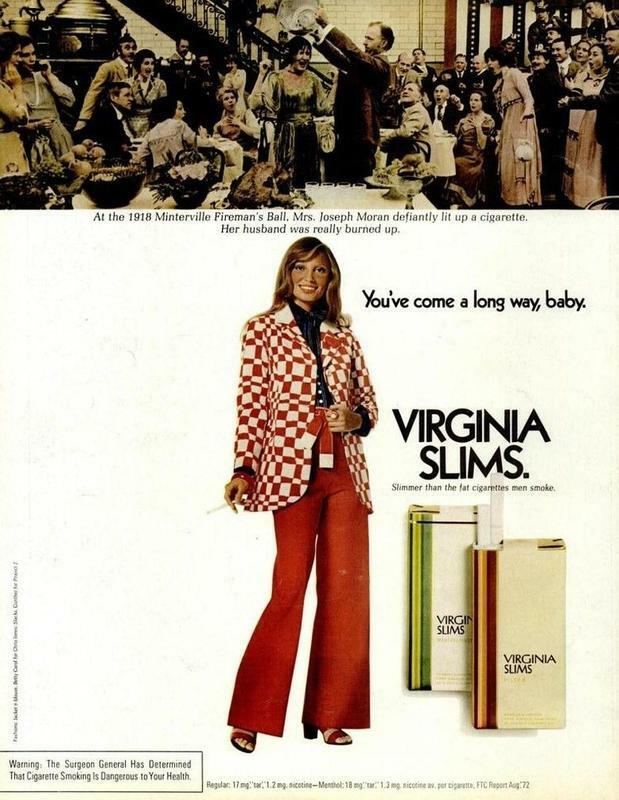 The “You’ve Come a Long Way, Baby” ad campaign was very successful for Virginia Slims and continues through the 1960s, 1970s, and 1980s. In the 1990s, Virginia Slims switched to “It’s a Woman Thing” as their advertising slogan and in the 2000s, they used, “Find Your Voice.” But the legacy of the “You’ve Come a Long Way, Baby” is still linked to the cigarette brand and its groundbreaking marketing approach to align itself with the women’s movement of the 1960s.